A flying saucer surveillance drone has been created by a British start-up company. Aesir has a prototype called Embler" that uses the "Coandă effect" which supposedly provides better lift for the device. Take a look at the well-controlled flying saucer drone in the video below. 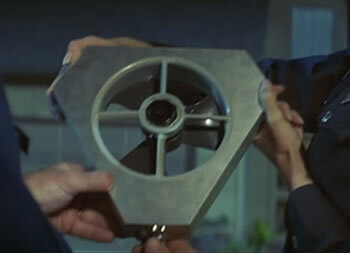 This flying saucer from Aesir looks a lot more cool than the ceiling fan hovering drone in Michael Crichton's 1985 movie Runaway. Update 30-Jul-09: Take a look at this picture of the drones from the recent Dark Angel series starring Jessica Alba. 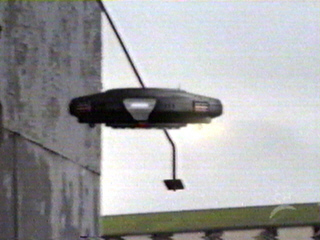 The drones were played an especially important role in one episode - they had been modified to assassinate. Throughout the series, Jessica (Max in-story) had to dodge the drones so as to not be detected. Thanks to Peter for pointing this out, and providing references. End update.